I have been spending so much time working on my router table that I haven’t done any pure practicing. So I set a goal to cut two sets of dovetails. Previously I had cut a set of tails, but have been way too much of a Wimpy McWimperson to try the pins. I wanted to live with the joy of the tails for a while, before I had to face the cold hard reality that the pins and tails don’t really fit together that well. Tonight reality slapped me around and called me a sissy. But that is ok, I needed it. The mental thrashing I took, from my poorly fitting joints, was somewhat motivating. When I cut the mortise and tenons, they weren’t pretty, but I practiced and they got better. I am confident that my dovetails will improve too. Were I to assess both sets, I would say I made a marginal improvement from the first to the second. The first pair was pretty loose, while the second was much tighter. The wood is oak. I used my Japanese hand saws for the cuts. I think that the main issue was with the quality of my saw cuts, especially the angled ones. I have made a fair amount of straight cuts with my saws, and the angled cuts are of a higher difficulty level. Not as high a difficulty level as the triple salchow, but I digress. 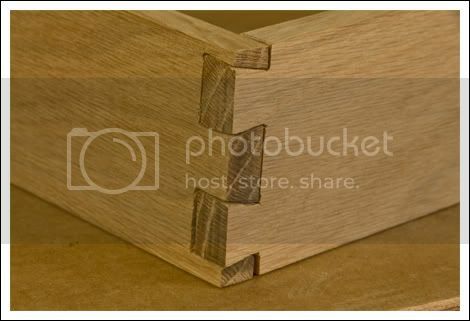 Of course, cutting dovetails by hand, isn’t a requirement for quality woodworking, but like the chisel work, I believe the skill will help me with my understanding of joints. Before today I hadn’t thought about the pins and their relationship to the tails. It seems the tails need to be on the side of the drawer. If it were the pins on the side, I imagine the drawer would come apart. I enjoyed my dovetail practice and it might be nice to do a small drawer and somehow graft it onto my router table. Will it look out of place? Yes, probably, but I can live with that, if it actually works and can hold my router bits. So tonight I practiced, I chose a skill, which I don’t have, and began to develop it. I believe that progress is to be celebrated. The imperfections that one creates along the way can be looked at lovingly, down the road, as sign posts on the journey taken. I love that suggestion! I am going to try it tomorrow, how very clever. I am sure it will make it easier. Thanks so much. Oh and I am glad you are enjoying my blog. I hope you will check out ‘Hello Dave’ too. Nice effort! Why does the end grain look so dark in the first picture? Is that a photography trick? Great question on the end grain. It is because I used my router to even up several boards at once, and I went a bit slow, and had some burning. So that is a bit of a blunder, but since this was only practice wood, I am not beating myself up too much. I use both a sharp marking knife and a 4H drawing pencil. They hard drawing pencils are nice, because they can draw a very fine line. I think that for the dovetails, the marking knife worked best though. Thanks for the post. 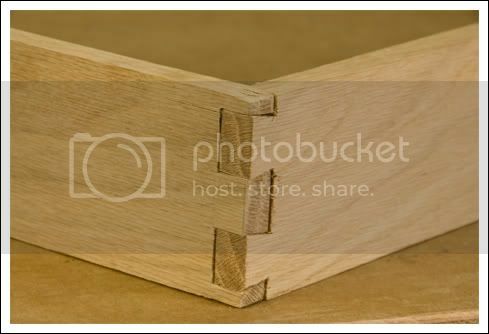 I remembered a video I saw at Fine Woodworking that may interest you by Gary Rogowski called The Five Minute Dovetail. 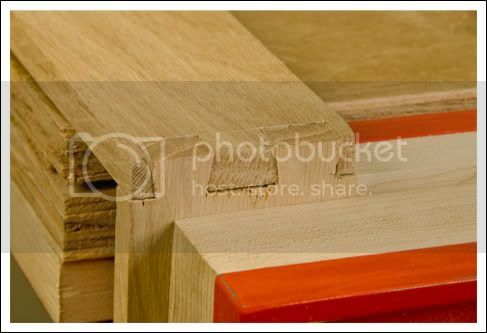 He agrees with you that making dovetails can make even your machine work better. He suggests a five minute dovetail as a way to warm up before starting the woodworking day much as any other athlete would do. I’m sure if you aren’t a member of FWW the link is worthless. Cool band too. Hello Dave! I like just saying that. I have no wisdom to pass on in regard to hand cuttting dovetails, since that is one skill I haven’t tried yet. But I wanted to pass on my comments on Hello Dave, the band. I enjoyed their music and it pleased me that it wasn’t hard rock, which I detest. I noticed the skilfull video cuts which not only increased visual interest but also exhibited considerable resources at their disposal. Too many tips all at once might create an overload situation Brian, but I can’t resist just one. It appears that you have used the thickness of the stock to mark the shoulder line. I would suggest you add about 1/32”. That way your tails and pins will protrude by that amount and you can then plane, chisel or sand them flush to the surface after the glue-up is dry. It looks to me that you are doing pretty well, so keep up the practice until you are satisfied. I think I would rather practice on pine though, as it’s cheap and quicker to cut. I hadn’t thought about leaving extra, so I will try the 1/32” trick today. I don’t have any pine to practice on, but next time I go to the lumberyard, I will pick some up. Thanks. I am glad you liked ‘Hello Dave’. Thanks for clicking. And thanks to the 21 people of 139 who clicked too! Every little bit helps. Procrastination is the word for my dovetail efforts…......eventually the day will come when I will have to face reality and go for it like you…....you seem to be making good progress…....just hope my first shot at dovetails is as good as yours!!! !